November | 2015 | This will all make perfect sense someday. November 29th. I love it. First up this week, Thanksgiving dinner. I love it. Last year, Brian convinced me to help him make a traditional Thanksgiving dinner with turkey, potatoes, green bean casserole, and pie. Considering I usually just ate pizza, I gave it a try and it was totally worth it. Now that we have the tradition, Brian and I cooked another big meal (with lots of leftovers). We ate until we were both just laying on the floor in a food coma. Again, totally worth it. The best thing about this year though was celebrating with our animals! Next up, Disney Infinity 3.0. I love it. I’ve been holding out on getting this game for a while because it’s expensive and I don’t like how you have to buy an all new set every time a newer version comes out. Well, I changed my mind once I saw that it was on sale for more than $30 off at Game Stop. This is by far my favorite version. It seems much more user friendly but still just as fun! Finally, decorating for Christmas. I love it. You bet that Brian and I moved right into Christmas! It’s our favorite! Last year we didn’t decorate, but this year, we needed to. It just seemed like the right thing to do. We bought a (fake) tree, stockings, and lots of lights and decorated yesterday. I’m definitely in the holiday spirit now! November 15th. I love it. Another week. Another batch of love. First up this week, Chutes and Ladders. I love it. Brian wasn’t feeling very well this week, so I bought him Chutes and Ladders… and beat him at it best of three. I forgot how cut throat games like that can be! Next up, the dog park. I love it. Today was our first trip to the dog park with Arthur and overall, he did a good job. He sniffed the other dogs and people, but as usual wasn’t interested in playing with them. Hopefully the more we socialize him, the better he’ll do. Finally, The Addams Family Musical. I love it. 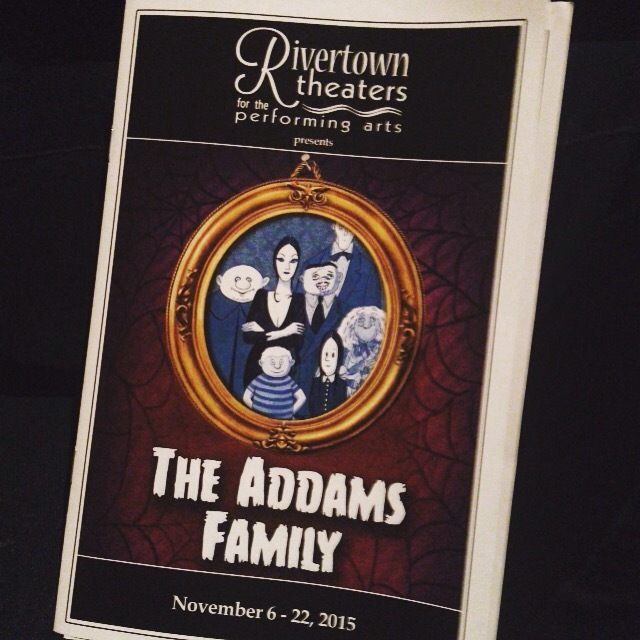 This months show at Rivertown was the Addams Family and overall I liked it. I wasn’t a huge fan of the storyline but all of the performers were excellent as usual! November 8th. I love it. First up this week, dinner cruises. I love it. This week, Brian and I celebrated our one year anniversary (yay) with a dinner cruise on the Mississippi. It was fabulous! Amazing food, great music, perfect weather… it was so nice! Next up. Le Pavillon. I love it. This hotel is downtown and it’s my absolute favorite! Not only is it super fancy, but they also serve peanut butter and jelly sandwiches every night. For free. What? Brian and I stayed there for our anniversary but after the big dinner we had on the boat, I was too full for my favorite food. We also got our room upgraded for free (aren’t we fancy?) and took the luxury of sleeping in in those super comfy hotel beds. Finally, making butterfly friends. I love it. Again, for our anniversary, Brian and I took our first trip to the Insectarium. The bugs were cool, but the butterfly garden was the best! I actually had a stow-away ride along with us for a little while. Apparently butterflies love hair (and I have a lot of it). I had to be “de-butterflied” before I left by the nice lady watching the butterflies. I wish I could have taken it home! November 1st. I love it. First up this week, napping. I love it. I probably say this a lot, but it’s so true. I remember when I was so anxious all the time that there was no way I could fall alders. That is not a problem anymore as evidenced by the naps I can take laying in the middle of my living room floor or with all of the lights on in my room. It even better when there are two animals snuggled up with me. Next up, Goosebumps. I love it. Growing up, I loved the books so I was pretty pumped to see the movie. It was actually really good! Finally, pecan candles. I love it. I splurged at Walmart and this candle? Smells so good! It’s like a pecan pie is baking in the oven. Mm mm!